Health and Ayurveda Minister Rajeev Bindal was greeted with a violent protest by activists of the Congress who not only raised slogans against him, but also urged him to go back during his visit to the Doon constituency today. Congress leaders, led by PCC general secretary Ram Kumar Choudhary, show black flags to Health Minister Rajeev Bindal at Landewal village on Thursday. 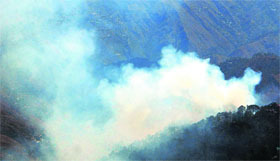 Devastating forest fires have become a normal phenomenon during summers due to the changing climate, thanks to the failure of the government to implement the measures recommended by the Khosla Committee to prevent blazes which are no longer confined to pine forests and even engulfing oak and deodar forests. The State Pollution Control Board (SPCB) today served notices on all five highly polluting cement industries in the state for causing air pollution with the ambit air quality being far higher than the permissible limit. Ram Lok, a CPI leader and RTI activist of the Namhol area, was attacked with a sharp-edged weapon by some people near Jhanda village, 35 km from here, on Tuesday night. A 17-year-old plus II student Nishant Gupta was drowned in the Sal rivulet, a tributary of the Ravi, while he was taking a bath in it last evening, an official report said here today. 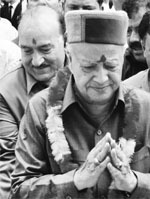 Union Minister and Mandi MP Virbhadra Singh termed the BJP regime under Chief Minister PK Dhumal as a sinking boat steeped in corruption, which had been running on the funds provided by the UPA government. Dhumal blaming the Centre for lack of funds was nothing but his unsuccessful way to hide his failure to govern the state, he asserted. Union Minister and Mandi MP Virbhadra Singh today underscored the urgent need to amend the criminal justice system as the Criminal Procedure Code (CrPC), particularly Section 161, is enough to harass and implicate even an innocent person. The police and Himachal Pradesh University (HPU) authorities today got all 400 rooms of seven boys’ hostels vacated following the high court directives that fresh allotment be made by the Registrar with intimation to the court in this regard. Taking a serious note on the issue of custodial beatings by the police, the state high court has directed the state government to pay compensation of Rs 15,60,000 to victim of custodial beatings Rajesh Sharma. Tibetans in exile today carried out carried out a candlelight march at McLeodganj this evening amidst reports that two more young Tibetans had set themselves on fire yesterday in Zatoe town of Keygudo, Kham, eastern Tibet. Tibetan sources here said the two youths who committed self-immolation were identified as Ngawang Norphel (22) and Tenzin Khedup (24). Both of them were carrying Tibetan national flags in their hands at the time of their self-immolation protest. BJP leaders were taken aback when Dr Bindal, who was scheduled to go to Landewal village, was greeted with a protest. 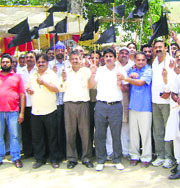 The activists raised slogans “Bindal go back” and showed him black flags at Shitalpur village. In a bid to avoid confrontation, he diverted his route through Dassomajra to reach Landewal where he inaugurated a newly constructed building of an ayurveda bhawan. The Congressmen, however, chased him till Landewal and raised slogans against him and the BJP government for almost half an hour. Peeved at Dr Bindal’s indifference,the Congressmen gheraoed his vehicle, which was locked from inside and hit it with sticks and fists. The police had a tough time trying to control the crowd where skirmishes were witnessed between Congress and BJP activists. Later, the police shifted Dr Bindal to the Baddi SP’s vehicle to take him to the site of the inauguration. Chowdhary said Dr Bindal who was steeped in corruption had lost the right to remain a minister as his own party leaders had levelled allegations of corruption against him. He said the BJP was taking credit for schemes approved by their government and even this ayurveda bhawan had been approved by former Congress MLA Lajja Ram. He added that the burning problem of water shortage, which plagued the Doon constituency, was not addressed and the government had failed to provide water through tankers. Condemning the incident, Dr Bindal said the Congress was unnerved with the large-scale development undertaken by their government and said they always behaved in a dictatorial manner. He said they would not be deterred by such protests and would continue to work for the state’s development. Baddi SP Gurdev Chand Sharma said cases would be registered against those who had damaged Dr Bindal’s vehicle. This season alone over 1,600 fire incidents involving about 19,000 hectares of forest area have been reported so far and with the monsoon already delayed, fires will continue to play havoc for another week at least. The plea of the Forest Department that hot and dry weather was responsible for the spurt in fires is untenable as it is a common feature nowadays due to declining snow in winters and rather dry summers. In fact, come summer and the 4,335-sq-km of fire-prone forests in the state are virtually transformed into a huge tinderbox. Until two decades ago, fires were mostly confined to pine forests up to an altitude of 1,600 metres, but now even oak and deodar forests at elevations of 2,500 metres are also experiencing fires, particularly in Shimla district. The Government of India took notice of the problem in 1995, when the highest number of fire incidents were reported from Himachal, Uttarakhand (then a part of Uttar Pradesh) and Jammu and Kashmir, and set up a committee headed by RP Khosla to go into its reasons and suggest short and long-term measures. The Forest Department took some follow-up action on its report and the Centre also provided about Rs 15 crore to the three states. But thereafter the long-term preventive measures were forgotten. The Section 35 (1) of the Indian Forest Act lays down that no fire will be kindled in any private land up to a distance of 100 metres from a forest, but the government has leased out forests to private companies for eco-tourism projects in its violation. Not surprisingly, one such project in Solan district was engulfed by a fire early this month. Comprehensive fire action plans for sensitive forest areas, right from the beat level upwards, are not being made and implemented. As a result fires break out with unfailing regularity and the department helplessly waits for rain to end the annual fiery ordeal. This year out of the total 2,301 km of fire lines, only 1,004 km were cleared and control burning was carried out only over 2,952 hectares. The department claims that forests up to 10 metres along 6,100 km of road length were also cleared of inflammable pine needles to help reduce fire risk. The recommendation to enforce the provision under which rights of villagers could be curtailed or even forfeited if they failed to assist the Forest Department in extinguishing forest fires had not been implemented. The efforts to involve villagers in the management of forests had also not yielded the desired results. The only way out is to carry out controlled burning over larger areas and create more fire lines and clear these before the fire season. Of late, controlled burning and clearing of fire lines have been severely restricted due to paucity of funds. The SPCB while serving the notices on the five cement industries have directed them to take remedial steps, which can bring the air quality to permissible level within one month’s time. The five industries, which have been found guilty of exceeding the permissible respiratory suspended particulate matter (RSPM), thus making the air highly polluted have also been given a list of recommendations for immediate implementation. The five cement plants who have been served on the notices includes ACC Cement Plant at Bilapur, JP Cement Plant at Bagheri in Nalagarh, Ambuja Cement Ltd at Nalagarh, Asian Cements at Nalagarh and Cement Corporation of India Plant at Rajban. The cement plants falls under the red-category list of most polluting industries and daily thousands of trucks ply to and fro from these plants causing high pollution levels. All five units have been asked to take steps to bring down pollution by taking measures like making the entire patch of concrete where trucks line up and park, sprinkling of water twice a day to reduce dust and taking steps for greening the area in and around the plants. The main reasons for the pollution are the emissions from the trucks, roads being unmetalled and dust storms. The SPCB, which monitors the air quality regularly intends to increase the frequency of these checks by making it more frequent. “The five cement plants have been served on notices to take steps to bring down the RSPM level within the permissible limit for which they have been given one month’s time,” conformed Sanjay Sood, Member Secretary of the SPCB. He added that there was a regular monitoring of the air quality to ensure that the pollution level was not too high. The main factors that have been identified for this polluted air are emissions from vehicles, mainly trucks resulting in emission of sulphur dioxide and oxides of nitrate. The monitoring by the SPCB was done on three parameters of stack, water and suspended particulate matter but it was mainly the ambit air quality, which was found to be quite high than the permissible limit of 100. In case of one cement plant, the RSPM had gone as high as 1500 also, with the air pollution at other cement plants also being well above the permissible levels. Asian Cements has also been asked to update and improve its pollution control devices as they were found to be not very effective. Reports said Ram Lok was going home to Jamalu-Noa village with another person by car when his vehicle was stopped on the road by some persons and after an altercation a “khukhri” was struck into his stomach by them. He fell down bleeding profusely and his accomplice was also beaten up. The report said on receiving information, the police rushed to the incident site and pulled out the body of the boy from the rivulet. Addressing a press conference, Virbhadra Singh said the BJP government had failed to provide even DA and other benefits announced earlier as it had mismanaged the funds. Health and other rural and urban development works were being run on the funds that the Centre was providing under the Jawahar Lal National Health Mission, MNREGA and the Urban Renewal Mission to the state, he added. Virbhadra said not a single primary school was opened by the present government. Instead it was in the process of closing 750 middle schools, he added. On the contrary, the UPA government had sanctioned the four-laning of the Manali-Kiratpur national highway. The Regional Ayurvedic Research Centre was also coming up at Pandho while the Rock Salt Mines Project was being set up at Guma, he said. On completing his 50 years of political life, Virbhadra said he had joined the Congress as its worker on June 23, 1962. He did not leave it even for an hour and would continue to serve it in the future also. He said the poor were getting work in rural areas because of Rs 1,000-crore MNREGA funds, ambulance services and rural health centres, and staff salaries were being run on NHRM funds. But the BJP government remained thankless, he added. Accompanied by state president Kaul Singh Thakur, former minister Rangila Ram Rao, Mandi Sadar MLA Anil Sharma, Balh MLA Prakash Chaudhary and former MILKFED Chairman Chet Ram Thakur, Virbhadra inaugurated a Khadi Bhawan and Coir Board showroom in town. Addressing members of the Mandi Bar, Virbhadra said he was informed that there could be thousands of innocents in the country who were suffering because of this dated law. He said Section 161, CrPC, put an innocent person at the mercy of the police and the prosecution. The police was at liberty to record even false statements, which were denied before the judge later. He urged the legal fraternity to form a public opinion on this criminal justice system. Referring to his audio-CD case, he said the case was an example of the dated criminal justice system. The police made a false case out of political rivalry, recording false statements against him first on the basis of a CD and now through an audio cassette. The police, along with HPU staff, removed the belongings of students and piled these up outside the hostels during noon. The court has directed that fresh applications of research scholars and students whose examinations were underway may be taken by the office of the Registrar and the Chief Warden along with relevant documents. The HPU authorities will place this list before the court tomorrow at 9.30 am. The HPU authorities have locked all 400 rooms occupied by 793 boys. However, the actual number of students as well as outsiders who were staying here illegally could be close to 2,000. While passing this order, Justice Rajiv Sharma observed that liberty of a citizen was of utmost important and in this case the police had not only curtailed his liberty, but given beatings to the victim to such an extent that he became 100% disabled. The court had directed the government to recover the compensation amount from erring officials the then SHO, Sadar, Shimla, Shiv Kumar Chaudhary, Sub Inspector Kanwar Singh, Assistant Sub Inspector Rattan Singh and Head Constable Mahender Singh. The court further directed to place these officials under suspension till the completion of the trial and departmental proceedings against them. Rajesh was given beatings at Sadar police station, Shimla, that made him blind. The court has directed the trail court to complete the trail in the criminal case under Sections 307, 326 and 201 against these police personnel within three months by proceeding on day-to-day basis. The court has also directed it to complete the departmental proceedings against the officials within three months and submit report to the court. To keep a check on the police, the court has directed the Chief Judicial Magistrates and Sub Divisional Magistrates to visit the police station every week. Tenzin died, while the condition and whereabouts of Ngawang were not yet known. Confirming the reports, Jamyang Soepa, member of the standing committee of the Tibetan Parliament-in-Exile, said the two young Tibetans set themselves ablaze calling for Tibet’s independence. “Ngawang Norphel and Tenzin Khedup called for independence and freedom in Tibet and long life of the Dalai Lama before setting themselves on fire,” Soepa said citing sources. In a seven-second video clip of their self-immolation protest, Ngawang and Tenzin could be seen standing next to each other just before fire enveloped their bodies. According to reports, Tenzin is from Tridu in Keygudo. His parents are Legdup and Kyizom. Ngawang is believed to be from Ngaba, the region which remains the nerve centre of the ongoing wave of self-immolations in Tibet. With Tenzin and Ngawang’s self-immolation today, as many as 42 Tibetans have set themselves on fire since 2009.